Designed and put together by Production Specialty for your application. If you need a special system, our engineers will design, build and install lubricating equipment customized to meet your specific demands. We’ve created exotic application systems for machining operations around the world, including but not limited to the examples shown. Contact Production Specialty at 1-800-748-9068, and our engineers will discuss with you any of your customized application or use the form on the right. 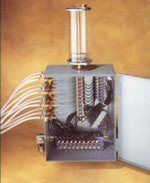 Custom Micro-lubrication systems can be built for any application. 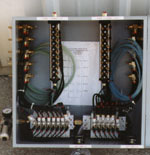 Above we show a12 nozzle, brass pump, solenoid applicator with 10 individual solenoid controls to operate 10 individual spindles separately and automatically, a 20 nozzle unit (center) and a 6 nozzle (right), brass pump, pneumatically controlled applicator with 6 individual air flow controls and pneumatic on/off switches to operate 6 individual machines. New CNC machines typically have several cutting heads and these systems can be configured to supply all of them at once or one at a time, when only only cutting head is in operation. 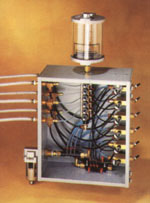 Production Specialty understands micro-lubrication systems. We can engineer the best lubrication system for your equipment, either job specific or machine specific.